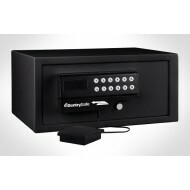 You can use the electronic key pad on this safe to open and close it. You can change the code (combination) at any time. 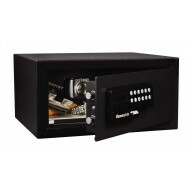 You can also use a card and swipe it to open your safe. You are never locked out because this lock comes with a back-up key. The H060ES Sentry safe is large enough to fit many lap tops. With good security features and especially if you bolt it down, you can have peace of mind about your valuables. This can be a personal safe, laptop safe or a safe for a hotel, dormitory room, or tenant situation. The Sentry HL100ES offers flexibility with a reprogrammable electronic lock that allows users the option of a keypad or card swipe entry. The safe is large enough to fit a 17" laptop computer. The HL100ES is small and can be stored out of sight in a closet. It comes prepared to be bolted down and the bolt-down hardware is included..